One big story in UK finance at the moment is the new design for the £50 note. UK banknotes change design roughly once every 10-20 years, and since the 1960s have included, in addition to the portrait of Her Majesty the Queen on one side, a portrait of a famous UK citizen on the other. 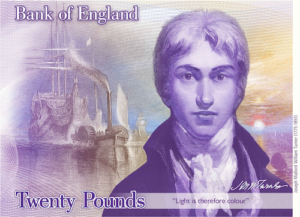 The new £50 will be the latest to join the new series of plastic-rather-than-paper notes started by the new £5 note in 2016, and will be the last one to do so – a new polymer £20 note to be issued from 2020 will feature a portrait of the artist JMW Turner. The choice of Turner followed a lengthy selection process undertaken by the Banknote Character Advisory Committee, who consulted with the public to suggest options and chose Turner from over 30,000 nominations. It’s been announced that the new £50 will definitely feature someone from the realm of science – which is exciting for fans of science, like me. But what I really want to know is, will it be a mathematician? Up until now, mathematicians did occasionally feature on UK banknotes – as long as you count people who weren’t famous for specifically being mathematicians. For example, the current £20, which will be replaced in 2020, features economist Adam Smith. Smith was also an author and philosopher, and his book The Wealth of Nations is considered to be the first modern book addressing the topic of economics. Smith discussed how self-interest motivates people in economic situations – ideas which presaged modern game theory – and that under competition, equilibria are established to optimise profitability. The note features a reference to his analysis of the division of labour in manufacturing. His ideas have formed the basis of much modern economics. The current £50 note features two portraits – business partners Matthew Boulton and James Watt. Watt was an inventor, chemist and mechanical engineer, famous for his steam engines, and Boulton was an entrepreneur and manufacturer who helped Watt go into business selling them. Watt’s engines designs were ingenious and more efficient than contemporary models, and represented a step forward in the technology which powered the industrial revolution. 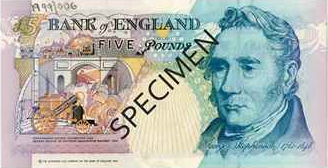 Watt wasn’t the only steam engine pioneer to have been featured on a UK banknote – a £5 note in circulation from 1993 to 2003 featured George Stephenson, inventor of the famous Stephenson’s Rocket (also featured on the note), and a talented engineer whose company manufactured engines and built railway lines all over the country, revolutionising rail transport. 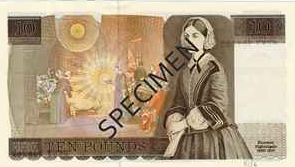 Probably the closest we’ve historically had to a mathematician on a banknote was Florence Nightingale, who appeared on the £10 note from 1975 to 1994. While Nightingale is probably best known for her work as a nurse in the Crimean War, and for revolutionising the field of nursing, mathematicians think of her fondly as a great early example of the use of a pie chart in communicating statistics – her polar area diagram used a circular chart to demonstrate how much more effective her methods were at preventing disease, and effectively convinced politicians to adopt her approach. The new banknote has to feature someone from science (along with a couple of other criteria – they have to be dead, and not a fictional character) who has contributed to the field, and ‘shaped thought, innovation, leadership or values in the UK’ as well as being an inspirational and non-divisive figure. So what are the chances it’ll be a mathematician? Ada Lovelace – the Countess of Lovelace worked with Charles Babbage (also on the list) to create and program the world’s first programmable mechanical computer. Her algorithms gave a way to compute Bernoulli numbers using Babbage’s Difference Engine. Alan Turing – considered the father of modern computing, and a hugely influential thinker in mathematics, computability theory and cryptography, after his work at Bletchley Park breaking the German Enigma code. He has also become an icon for gay rights, after famously being convicted (and posthumously pardoned many years later) of homosexuality, which was then a crime. Bertrand Russell – philosopher and mathematician, also famously a pacifist and political activist, and the originator of some of the founding theories of logic and proof. He is widely held to be one of the 20th century’s premier logicians, and a founder of analytic philosophy. Bill Tutte – less famous than Turing, and undeservedly so, Bill Tutte also worked in codebreaking at Bletchley Park on the top-secret Lorenz Cipher, used by the high-level German military. Tutte’s efforts were crucial in ending the war, and he also had a number of significant mathematical accomplishments, including foundational work in the fields of graph theory and matroid theory. Christopher Zeeman – mathematician working in geometric topology, catastrophe theory and singularity theory, but also well-known as a brilliant populariser of mathematics. His Royal Institution Christmas Lectures in 1978 were the first to be given on mathematics, and inspired the Ri’s now national Masterclass programme, which allows thousands of children to engage with higher-level maths topics outside of school. The Christopher Zeeman Medal for Communication of Mathematics is awarded in his honour. George Boole – mathematician, philosopher and logician whose book The Laws of Thought laid out the theory of Boolean Algebra – using simple logical operations to manipulate truth values – which became the foundation of all of modern information theory and computing. Hertha Ayrton – engineer, mathematician, physicist and inventor who not only taught mathematics and devised mathematical problems, but also patented a line divider – an instrument for dividing a line into equal parts, which became widely used in engineering. She also worked in the field of electricity, studying arc lighting, and being the first woman to join the Institution of Electrical Engineers, in 1899 (the next woman to be admitted was in 1958). So who would you choose to put on a banknote? And which other countries have famous figures on their notes? I wonder which country has the most mathematicians…? John Horton Conway. But he is still alive, so maybe not eligible? If you haven’t heard of him: S. Roberts, “Genius at Play” is a wonderfully written biography. I prefer Jane Austen. A lot of people make a pilgrimage to Winchester to see her House. Bertrand Russel, a true Universal Genius (Polymath), author of Principia Mathemathica and Literature Nobel Prize winner – very british. I’m a bit torn on Srinivasa Ramanujan being on the list. On one hand he was a great mathematician and certainly deserves to get recognition but on the other hand he was primarily Indian, not British. I know that India was part of the Empire back then but does anyone know what India would think about him being on the bill? > […] So who would you choose to put on a banknote? is not a designation of any set (and in particular not the shortest designation of any set). ??? Shape and extension of a particular “object” under consideration is defined by the material constituents of this particular “object” themselves, by their geometric relations amongst each other. The length of such an “object” is defined as the distance (of the stretch) between, let’s say, both ends of this “object” which are the furthest apart. And nothing else. Of course there may other objects, participants/constituents/ends, stretches be considered besides the aforementioned one, and their lengths (distances) may be determined, too, and be compared with the length of the aforementioned object. But that doesn’t in any way change or impede that for each pair of ends (which is suitable, i.e. resting with respect of each other) its very own length (distance from each other) is unique (uniquely defined). Nor would any conceivable sprinkling of such pair of ends with coordinate tuples change that. Shape and extension of an specific “object” are plainly intrinsic (provided its has any at all). > [due to the relativity of simultaneity].